If UFC 161 marked Roy Nelson’s (pictured) Octagon finale, he sure went out with a bang. Unfortunately for “Big Country,” he was the one who got blasted by Stipe Miocic. The good news for Nelson is that he set a UFC record on Saturday. The bad news is, he is now the only fighter to absorb 437 significant strikes without being knocked out. However, it appears Nelson’s biggest battle lies ahead of him at the negotiating table. Now that the likable heavyweight has officially entered free agency, he and rival UFC president Dana White want to clear the air regarding some inaccurate – yet top secret – stories that could help open the path for a return. 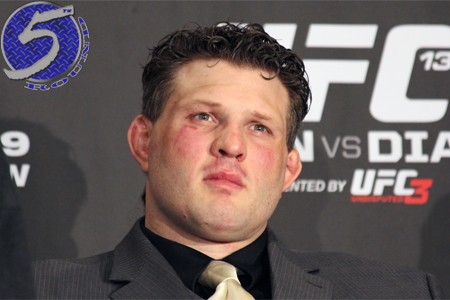 While White continued to question Nelson’s intelligence level – like when Nelson requested and received a higher salary than “The Ultimate Fighter” contract he was on, but subsequently declined it to remain on his smaller deal because it “wasn’t what he wanted,” or when he turned down a contract extension prior to meeting Miocic in hopes of increasing his negotiating power with a win and now faces a possible exile due to the defeat – he admitted the UFC would like to retain the slugger’s services. It will be interesting to see how this free agency period plays out for Nelson. If he and the UFC can’t come to terms, many believe he’ll strike a deal with Viacom that mirrors what Muhammed “King Mo” Lawal and Quinton “Rampage” Jackson received where he can compete in Bellator MMA and TNA Impact Wrestling. The 36-year-old Nelson owns a 19-8 professional record. His last 10 victories have come in (T)KO fashion.